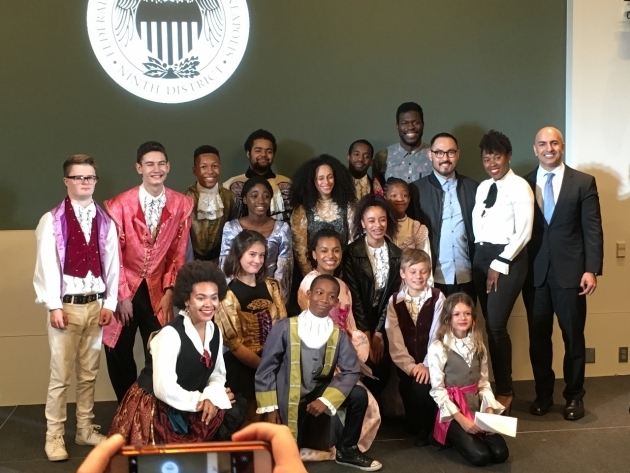 Students from the Lundstrum Center pose for a post-performance photo with three 'Hamilton' actors and the president of the Federal Reserve Bank of Minneapolis. They play historical figures onstage, but do they know history? That question animated a quiz bowl held Tuesday at the Federal Reserve Bank of Minneapolis. The event could have been titled, “Are ‘Hamilton’ stars smarter than Twin Cities students?” for it featured Broadway actors from the touring production of Lin-Manuel Miranda’s blockbuster musical testing their knowledge against that of rising scholars from Patrick Henry High School, the FAIR School and Lundstrum Performing Arts. The cohort from Lundstrum Center came in period costume and performed the opening number of “Hamilton,” infusing their rap with dances such as the Whip and the NaeNae. In the quiz bowl portion of the event, hosted by Minneapolis Fed president Neel Kashkari, Scatliffe, Ta’Rea Campbell (Angelica Schuyler) and Marcus Choi (George Washington) gamely answered questions like how many banks existed in America when Hamilton, the father of the nation’s banking system, established the first national bank (three), and where it was located (Philadelphia). The 100-plus students recorded their answers electronically, with their votes averaged, while the trio of Hamilton actors consulted with each other before settling on an answer. The show has become a boon for educators, as it’s gotten lots of youngsters curious about the nation's past. “If something like this existed when I was younger, I would have definitely been more interested in history,” said Campbell. “And we would have gotten more of the questions right,” said Choi, laughing. That’s right: By a nose, the “Hamilton” cast was bested by the students. The youngsters didn’t want to miss their shot.